Every day, 28 people die across the country in motor vehicle crashes caused by alcohol-impaired drivers, according to the latest data from the Centers for Disease Control. That works out to one drunk driving death every 53 minutes, racking up more than $44 billion in costs annually. Despite the fact that drunk driving deaths have slowly trended downward nationwide, last year was one of the worst on record and still account for nearly a third of all traffic-related fatalities. We understand the life-changing impact that drunk driving accidents have on their victims, so we are here to help. Call our drunk driving accident lawyers out of Denver, Colorado for a free consultation if you are hurting from a similar situation. Nationwide, authorities arrested more than 1.1 million drivers for driving under the influence in 2014, the most recent year for which data is available. In Colorado, authorities reported mixed results on drunk driving enforcement efforts. Early 2016 data reveals a 1.4 percent drop in DUI arrests while DUI fatalities jumped 8 percent. Impaired drivers killed nearly 200 people across the state in 2016. Driving while impaired can result in not only death, but serious injury for yourself or others around you. Do not put your own or other people’s lives in danger while driving drunk, or a personal injury attorney will come knocking for compensation. Efforts to combat this public health problem have intensified in recent years with the assistance of DUI injury lawyers. Despite the passage of strict laws with increasingly tougher penalties for driving under the influence, along with stricter Blood Alcohol Content (BAC) limits, people still drink and get behind the wheel, causing major injury or even death to thousands of victims every year. If you have been injured by an impaired driver in a motor vehicle accident—regardless of what they were under the influence of—you could be entitled to compensation for your injuries. 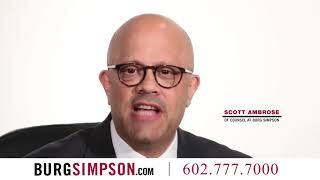 Burg Simpson’s drunk driving accident lawyers are here to help you. Contact one of our Denver personal injury lawyers today by filling out a Free Case Evaluation form or reading more on auto/car accidents here. Most people think of impaired drivers as just those operating under the influence of alcohol. But 2015 saw a tragic first; more drivers died in auto accidents under the influence of drugs than alcohol. More than 40 percent of drivers tested in fatal accidents confirmed positive for drug use. Only 37 percent tested above the legal limit for alcohol. With the increased legalization of marijuana, it is not surprising that more than 35 percent of drivers who tested positive had used marijuana. Amphetamines were the second-most popular drug of choice: a little less than 10 percent of drivers tested positive for the illegal stimulants. The wave of legal marijuana spilled onto the state’s roadways. Between 2006 and 2014, marijuana-related traffic deaths jumped 154 percent, according to a September 2015 Rocky Mountain High Intensity Drug Traffic Area report. Additionally, Colorado emergency room hospital visits “likely related to marijuana increased by 77 percent from 2011 to 2014.” In 2006, marijuana-related traffic fatalities made up from 6.92 percent of all traffic deaths in Colorado. By 2014, that numbers jumped to nearly 20 percent of all motor vehicle deaths. When it comes to filing litigation against an impaired driver who has caused you harm, you could be entitled to punitive damages, as well. Punitive damages are those awarded in cases of serious or malicious wrongdoing to punish and are designed as a deterrent — such as driving while impaired by drugs and/or alcohol. Burg Simpson is dedicated to holding irresponsibly impaired drivers accountable for the injuries, deaths, and destruction they leave in their wake. Contact our lawyers for help with your case now. When handling these claims for our clients, we usually pursue punitive damages on impaired drivers who cause our clients injury or death. It is true drunk driving and drug use contribute to the majority of auto accidents. However, other factors such as prescription drug abuse, fatigue, road rage, and even age can result in impaired driving. Prescription drugs- It is not just illegal drugs that can impair your ability to drive. There are dozens of perfectly legal prescription medications that alter your ability to operate a motor vehicle when abused. There is a reason so many come with warning labels. According to the FDA, some of the drugs include prescriptions for anxiety, some antidepressants, cold remedies and allergy products, sleeping pills, and even some pain relievers. Harmful side effects for drivers can include sleepiness, blurred vision, fainting, and delayed reaction times. Road rage – Road rage incidents are the most extreme type of aggressive driving, which plays a role in more than half of fatal motor vehicle accidents. According to AAA, road rage accidents injured or killed roughly 1,700 drivers every year. These incidents are on the rise as well, jumping 30 percent over last year. Age – Finally, at a certain age, our ability to drive can even become impaired. Based on the latest data, in 2015, more than 40 million drivers on the road were 65 or older – a 50 percent jump over 1999. More than 5,700 older drivers died and more than 236,000 were hurt in motor vehicle crashes in 2014, the most recent year for which data is available. 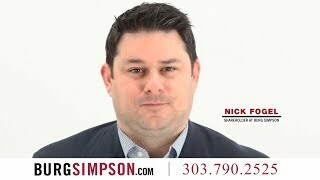 Contact the Colorado personal injury attorneys at Burg Simpson to discuss your case today! Sometimes employees of companies choose to drive impaired while on the job. Semi-truck drivers, for example, often use illegal drugs and stimulants to keep themselves awake on the road. In other cases, if an employer knew or should have expected that its employees posed a danger to the public because of a driving record dotted with drunk driving convictions or positive drug tests, that employer could be responsible for a claim of compensation. Such cases could also include jury verdicts that include punitive damages as a way to punish the company for its irresponsible business practices. Employer liability for impaired employees operating motor vehicles fall into one of two categories. 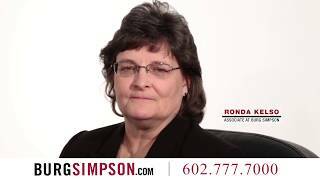 The first is employee negligence, which can involve the careless hiring and/or supervision of an employee. This ranges from not running a proper background check on an employee to not employing and/or communicating proper safety policies and procedures. Examples include truck drivers with a bad driving record or an employer sending workers into a plant without any safety training. The second is what is called vicarious liability, a doctrine of law that insists the actions of one party (in this case the employee), is essentially the same as the party (the employer) directing the employee. If, for example, an employer sends an employee out to pick up a vehicle and wrecks the car on the way back, the employer could be liable. However, if the employee stops to pick up his dry cleaning on the way back and hits another customer in the parking lot, he is not operating as an agent of the company, so the employer typically is not responsible. Just last year, Burg Simpson’s Denver personal injury attorneys won a seven-figure jury verdict against a major car rental company for their employee’s irresponsible behavior on the road. The bulk of that jury award came in the form of punitive damages. It turned out to be the eighth-largest jury verdict in Colorado that year. If you need help, fill out a Free Case Evaluation form here before it is too late. If you have been injured by a drunk, high, or otherwise impaired driver, it is critical you reach out to Burg Simpson’s attorneys as soon as possible. We are dedicated to helping anyone injured by drunk and otherwise impaired drivers who have been negligent. We want to help you on the road to recovery just as much as we want to prevent these offenders from hurting anyone else in the future. Our experienced trial lawyers have decades of experience and have helped thousands of victims recover from serious personal injuries at the hands of impaired drivers. We are here to help you rebuild your life and, in the process, help punish impaired drivers to keep them off the road. Our lawyers are well-qualified and have the resources to help victims navigate the many legal issues that surround auto/car accidents involving drunk drivers. Our expertise includes extensive experience with accident and medical investigation, insurance claims, settlement negotiations, and litigating in court against anyone – whether it is an individual or a corporation – who refuses to take responsibility.